Quality traditional Scottish Piper currently with the "1st Battalion Scots Guards" for weddings, funerals, events, etc., to enhance the ceremonial aspects at important times with the assurance of extensive experience and a real sense of both style and occasion. Pipe Major David Waterton Anderson, KSG, OLJ, has been developing his extensive skills on the highland bagpipes since he was a seven year old Boy Scout. He has enjoyed a long and varied career playing and competing in pipe bands and also solo which has seen him perform in many countries around the world. 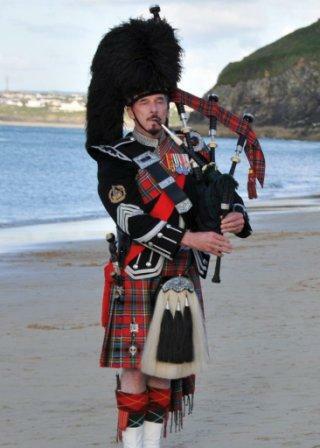 Past Pipe Major of the "Pontefract & District Caledonian Pipe Band" who became grade 2 "All England Champions" in 2004. One of only two pipers in the United Kingdom who have been honoured with a State Knighthood and should you be seeking that true sense of Scottish style, tradition and expertise for your special day, David is the man when things need to be "right."